A time traveler stumbles upon a horrific plot to alter the future in this adventure from “one of science fiction’s most revered writers” (USA Today). Born with a strange genetic mutation, Jack Havig can travel backward and forward in time at will. His unique gift enables him to visit ancient Rome, the Byzantine Empire, and the Wild West. He’s even seen the far future, when the ecology-minded Maurai Federation dominates a world nearly obliterated by nuclear war. Jack undertakes these voyages with one objective in mind: to find others who share his remarkable abilities. In the shadow of the Crucifixion, Jack finally achieves his goal. But a terrible darkness clouds his admission into the secretive, time-traveling organization called Eyrie when the group’s true intentions become clear. For Eyrie’s plans include an unthinkable genocide designed to irrevocably alter the destiny of humankind—and Jack is the only one who can stop it. But he won’t be able to do it alone. 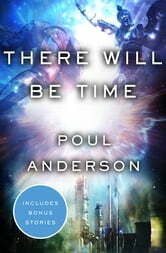 The prolific and remarkable Poul Anderson dazzles once again with a humanistic science fiction adventure that races across the boundaries of time. Lightning-paced and marvelously inventive, There Will Be Time is an unforgettable journey through the ages from one of the greats of twentieth-century science fiction.